Rickety entrance gates cobbled together from Juniper cedars are not normally what stands at the opening of property on a busy highway in a boomlet town. But the gates were open and two men were at work, so I drove in. I was prompted to do so out of curiosity. The property on the whole was curious, slotted tightly between the town’s old business district on one side and new big box stores, like Lowe’s and Wal-Mart, on the other. 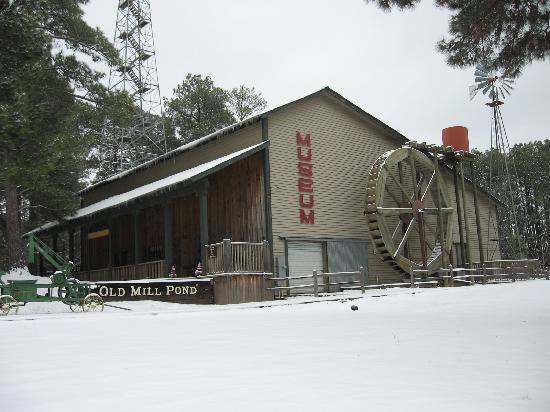 Jumbled throughout the slice of pine woods, there was an old 100-foot-high look-out tower, unfinished metal warehouses, dirt roads and, conspicuously, an old-time water wheel. The entire property was apparently one of those last small town hold-outs against lucrative commercial development. But the most unusual part of the property was as small parcel of land partitioned off with a white rail fence from the rest of the work-in-progress. 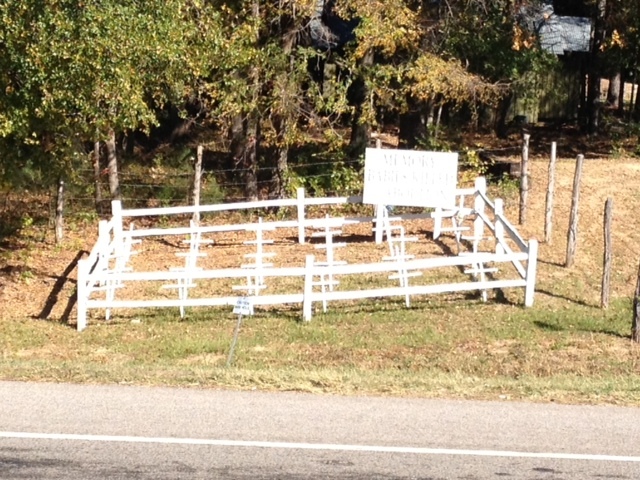 A sign was planted inside the plot: “In Memory of Babies Killed by Abortion”. Inside the parcel of ground stood rows of white crosses. I stopped the pickup close to the workers and walked up to them. They were digging a post hole beside the old water wheel. One of them was an elderly man sitting on a bar stool and the other was a thirty-something Latino with a post hole digger. And it turned out that the old man was supervising while the other piddled at the hole, speechless for as long as I was with them. “What can I do for you, young man?” the old man asked. The old man looked around and then back at me. “I’m building a tractor museum,” he said, decisively. “A tractor museum?” I asked. “Yep. You probably saw those two old tractors back by the office,” he said. I had not seen them, but I looked through the trees and saw that there were in fact a couple of old tractors back by a metal building with a boardwalk porch. “That one’s an old John Deere. The other one is an Oliver. My dad used that one for years,” he said. He took his time telling me this and stayed seated on his stool. His merry eyes and his measured speech told me that I was caught by an incorrigible story-teller. He knew it. I knew it. There was nothing left to do. I settled in for a good story.